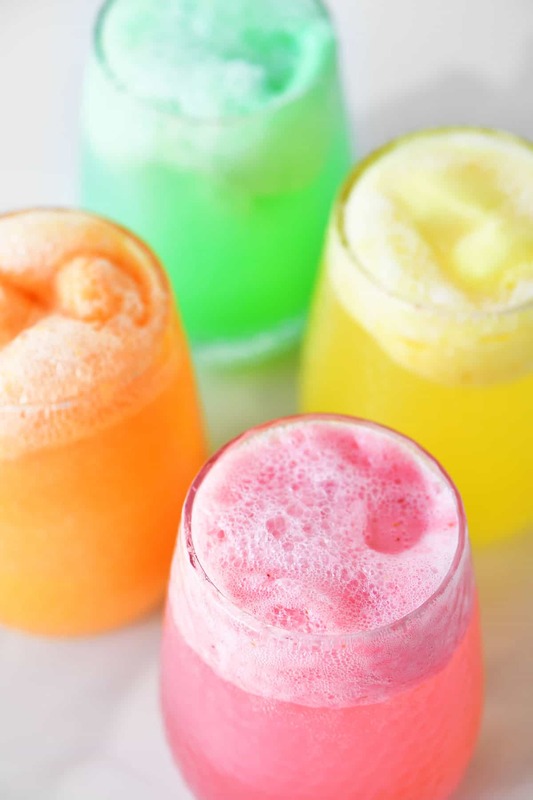 Make these Sherbet Punch Recipes for every party and holiday dinner! 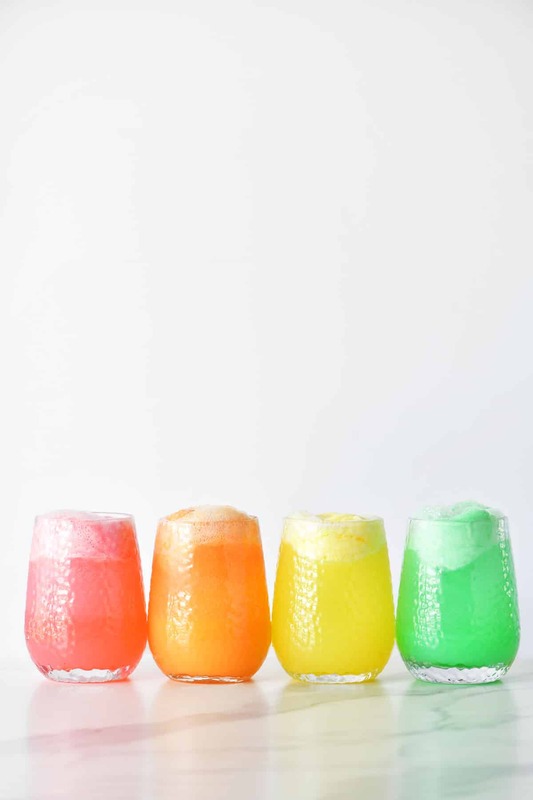 Choose from strawberry, orange, lemon, and lime punch or make all four for a variety. Growing up I remember every celebration, birthday party, and holiday dinner at my grandparent’s house included a sherbet punch. It wasn’t always the same flavor but it was always delicious. 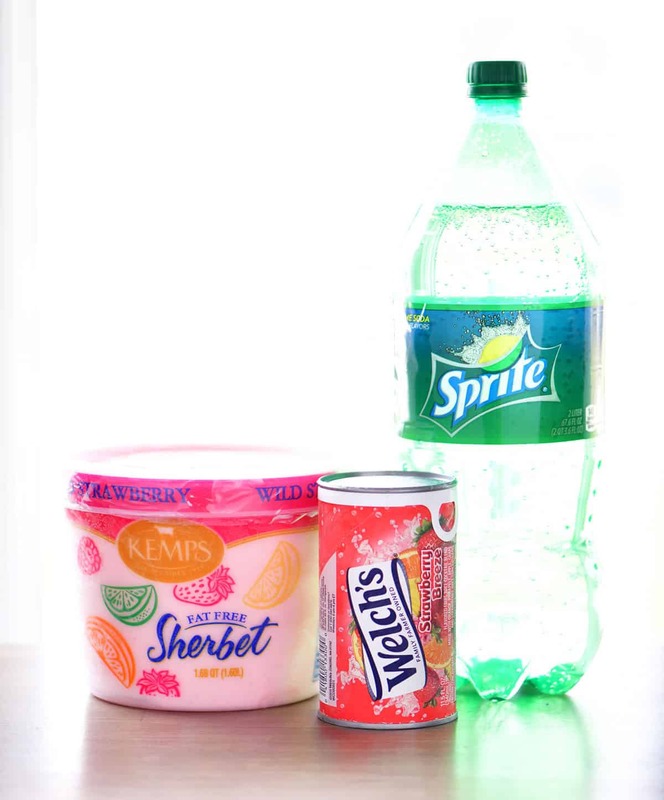 There are so many different ways to make sherbet punch from the basic recipe with just lemon-lime soda and sherbet to recipes including several kinds of juice and berries. Today I’m sharing four sherbet punch recipes that are easy to make and you don’t even need a punch bowl and it can be prepared ahead of time! Where are the sherbet punch recipes? In this post, I will share step-by-step instructions with photos for how to make sherbet punch, as well as answering FAQs about the recipe and sharing a short video showing the recipe in motion. But you can go directly to the recipes by scrolling down to the bottom of the post or use the table of contents above to skip to a section. Drinking strawberry sherbet punch is like having a taste of summer in your cup! 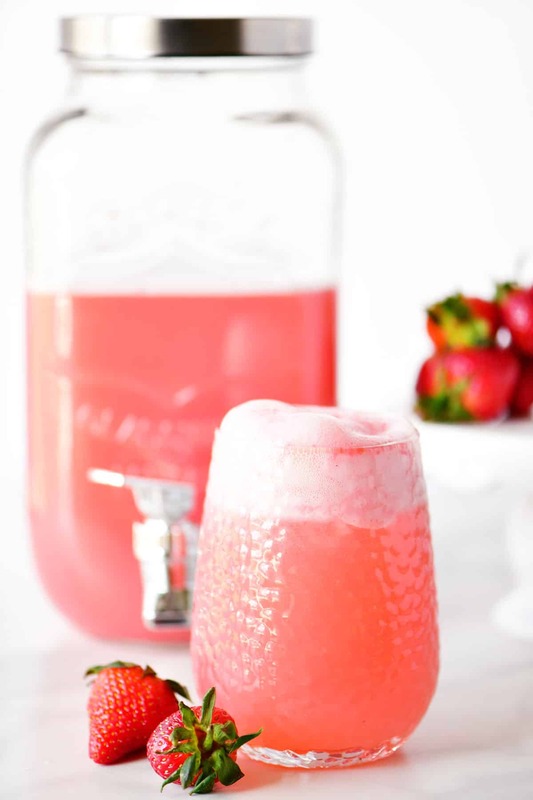 You can serve the yummy pink punch at weddings, baby showers, and bridal showers as well as birthday parties. To make strawberry sherbet punch, you’ll need frozen strawberry concentrate, water, strawberry sherbet, and lemon-lime soda. What can I use instead of frozen strawberry juice concentrate? If the frozen strawberry juice concentrate isn’t available in your area, you can substitute the concentrate and water with 5 1/2 cups of chilled strawberry (or strawberry kiwi) juice. It can be purchased ready-made or you can make juice using Kool-Aid or Crystal Light powder. Would other kinds of soda work in this recipe? Yes, you can use ginger ale, sparkling water (for less flavor) or strawberry soda (for more intense flavor and color). Choose a pitcher that you want to use for your strawberry punch. Mix together the frozen strawberry concentrate and water to make strawberry juice. Then, stir in some of the strawberry sherbet until melted. Finally, add some of the lemon-lime soda. 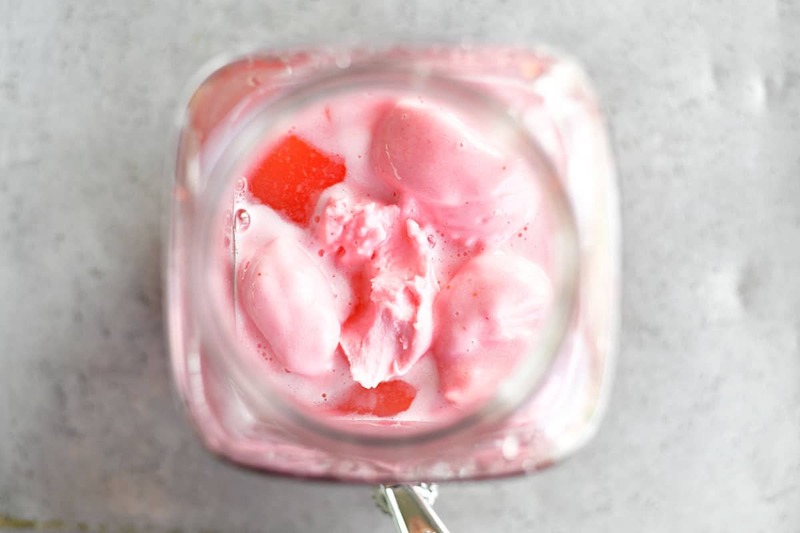 When ready to serve, put a scoop of strawberry sherbet into a glass. Fill the cup halfway with the strawberry sherbet punch and then fill it the rest of the way with lemon-lime soda. Use whole strawberries or sliced strawberries as a garnish on the glasses or you can even add them to the punch. 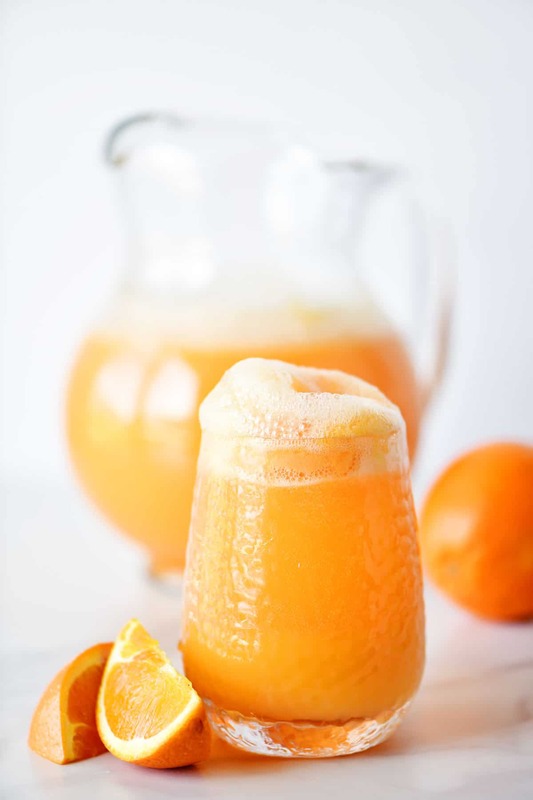 This orange sherbet punch recipe is a frothy combination of orange juice, orange sherbet, and lemon-lime soda! It is perfect for Halloween, Thanksgiving and any summer celebration. 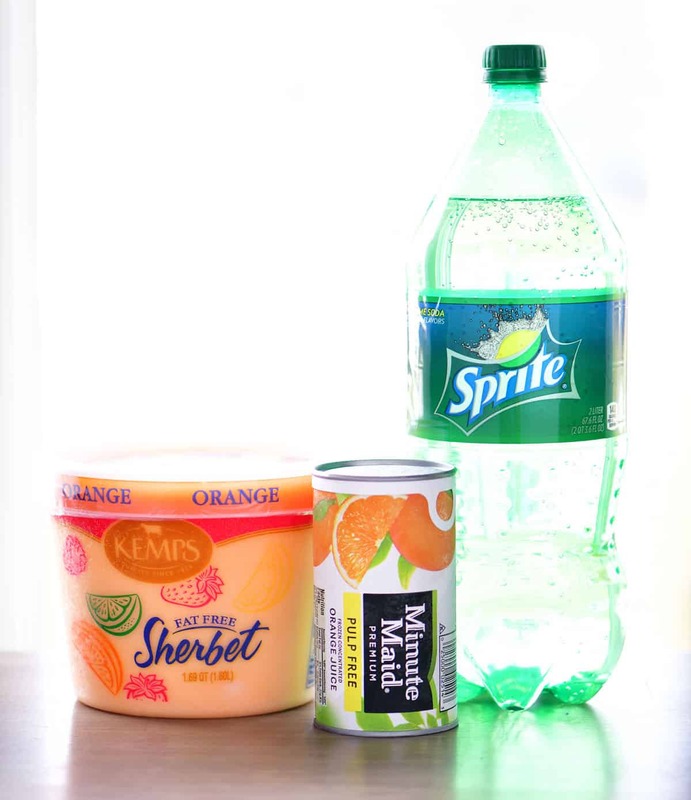 To make Orange Sherbet Punch, you’ll need frozen orange juice concentrate, water, orange sherbet, and lemon-lime soda. What can I use a substitute for the frozen orange juice concentrate? You can substitute the orange juice concentrate and water with 5 1/2 cups of any kind of chilled orange (or citrus) juice. 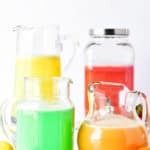 It can be purchased ready-made or you can make juice using Kool-Aid or Crystal Light powder. What other sodas could I use for this punch recipe? Try using ginger ale, sparkling water (for less flavor) or orange soda (for more intense flavor and color). To make orange sherbet punch, mix together the frozen orange juice concentrate and water. Stir in some of the orange sherbet and then add some lemon-lime-soda. To serve the orange sherbet punch, put one scoop of orange sherbet in a glass. Add enough orange sherbet punch to fill the glass halfway. Then, add lemon-lime soda until the foam reaches the top of the glass. If you want to pretty things up, add orange slices or wedges to the rim of the glasses or even to the punch in the pitcher or cups. 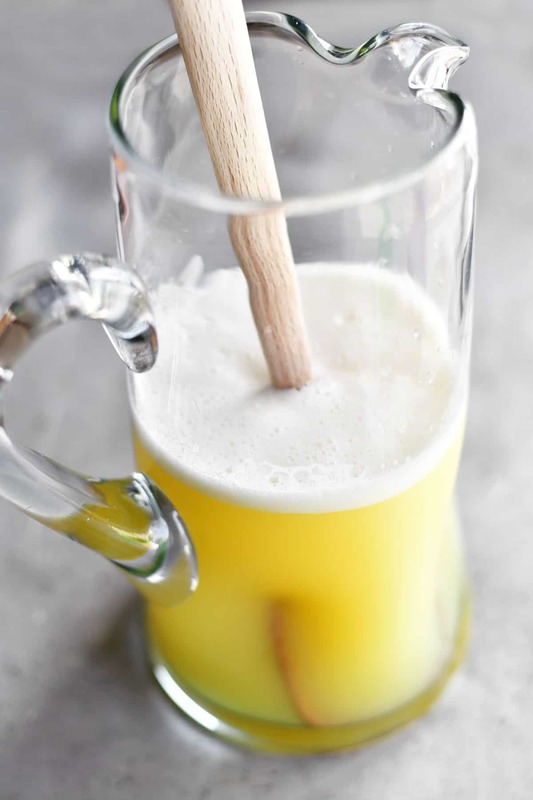 This lemon sherbet punch recipe tastes like a frosted lemonade! It is a delicious combination of tangy and sweet. Serve it at baby showers, birthday parties, and summer barbecues. 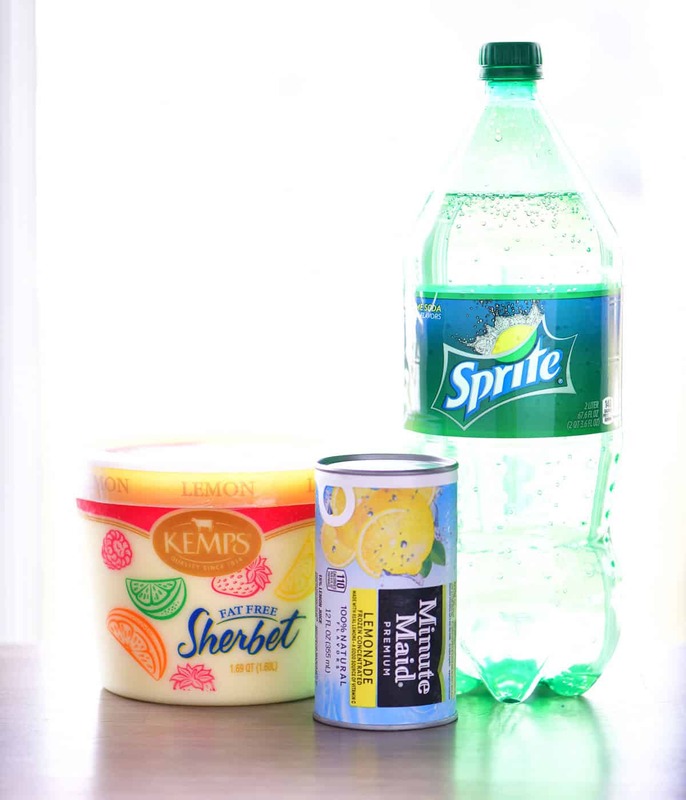 To make lemon sherbet punch, you’ll need frozen lemonade concentrate, water, lemon sherbet, and lemon-lime soda. Is there anything I can use instead of frozen lemonade concentrate? You can substitute the lemonade concentrate and water with 5 1/2 cups of any kind of chilled lemonade or citrus juice. It can be purchased ready-made or you can make lemonade using Country Time or Crystal Light powder. Would other kinds of soda work in this punch recipe? Instead of using lemon-lime soda, you could try using ginger ale, Mountain Dew, sparkling lemonade or lemonade soda. Start by mixing together the frozen lemonade concentrate and water. Add four scoops of lemon sherbet and stir until melted. Then, pour in some of the lemon-lime soda. When ready to serve, add a scoop of lemon sherbet to a glass. Then, add some of the lemon sherbet punch and top the glass off with lemon-lime soda. 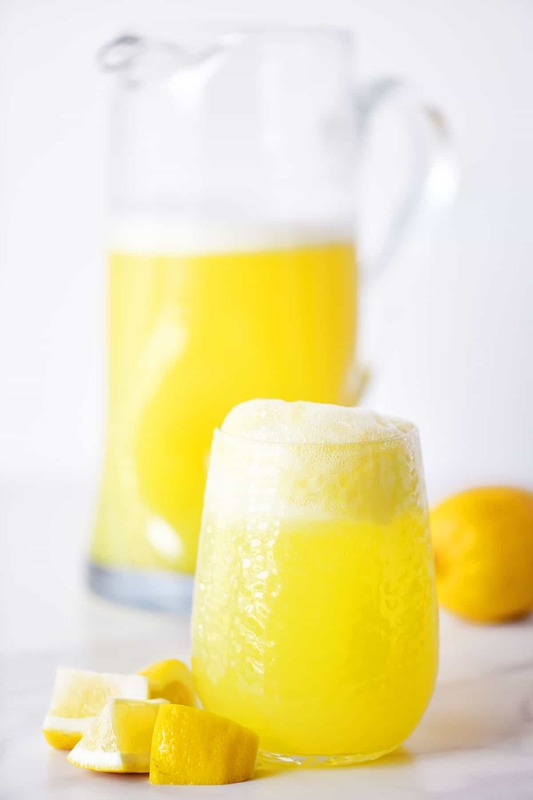 You can use lemon wedges or lemon slices for garnish both on the cups and inside the pitcher of punch. This Lime Sherbet Punch recipe is a refreshing combination of sweet and zesty. It is perfect for serving at Christmas parties, St. Patrick’s Day and at baby showers! 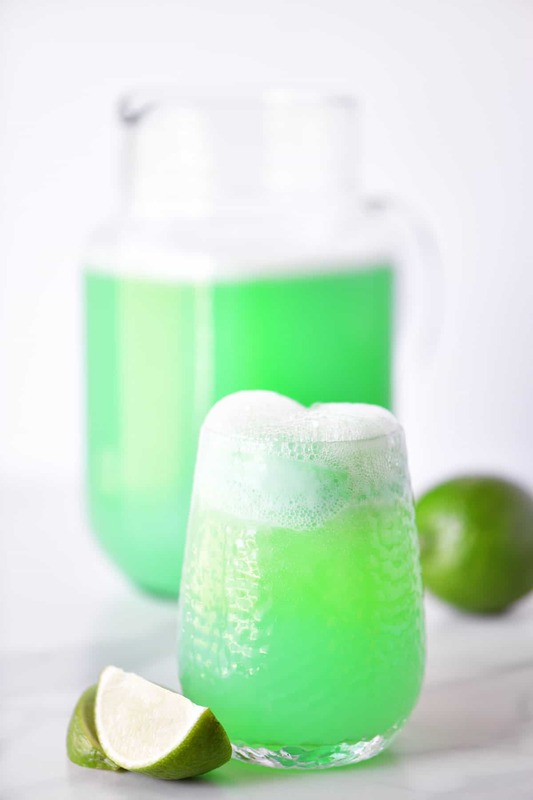 You only need four ingredients to make lime sherbet punch: frozen limeade concentrate, water, lime sherbet, and lemon-lime soda! Do you have any suggestions for a frozen limeade concentrate substitute? You can substitute the limeade concentrate and water with 5 1/2 cups of chilled limeade or lemonade. 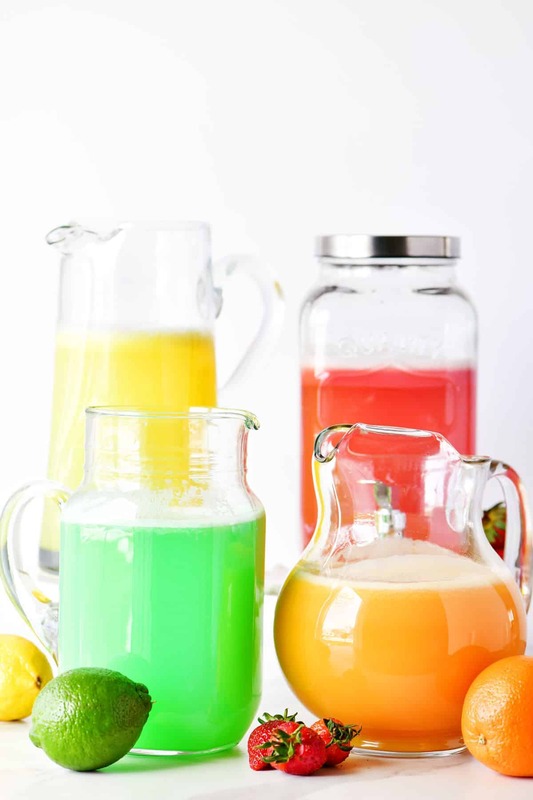 It can be purchased ready-made or you can make juice using Kool-Aid or Crystal Light powder. What other sodas could I use for this punch recipe? Try using ginger ale, Mountain Dew or lime sparkling water (for less flavor). Making lime sherbet punch is super easy! Starting with making the limeade by mixing together the frozen limeade concentrate and water. Then, stir in four scoops of lime sherbet and finally add two cups of lemon-lime soda. 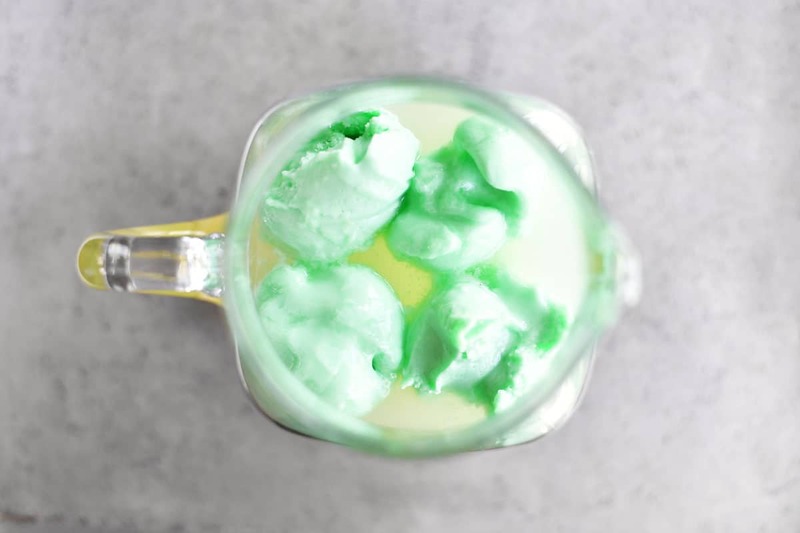 To serve the lime sherbet punch, add a scoop of sherbet to each glass. Then, fill the glasses halfway with the lime sherbet punch from the pitcher. Fill the rest of the cup with lemon-lime soda. For a garnish, you can add lime wedges or slices to the rims of the glasses or even to the punch! 1. Can these sherbet punch recipes be made in and served from a punch bowl instead? Yes, that is another option. 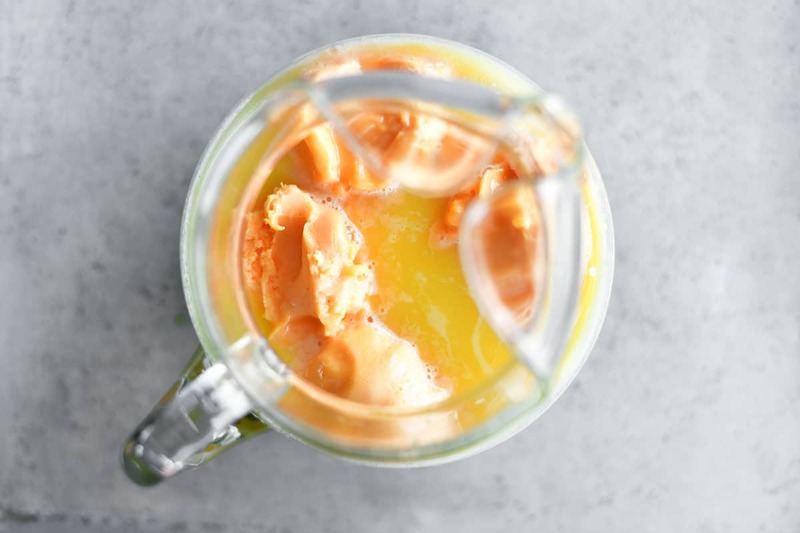 After mixing in the four scoops of sherbet, add the remaining scoops of sherbet to the punch so that they are floating on the top. Slowly fill the rest of the punch bowl with the lemon-lime soda. 2. Can I make this sherbet punch ahead of time? Yes! That is why I love making this sherbet punch recipe. The punch in the pitcher can be stored in the fridge until ready to serve. Just give it a good stir after removing from the fridge. And since a scoop of sherbet and fresh lemon-lime soda is added to each cup, everyone will still get that frothy goodness! 3. Is there a way to make a lighter sherbet punch? 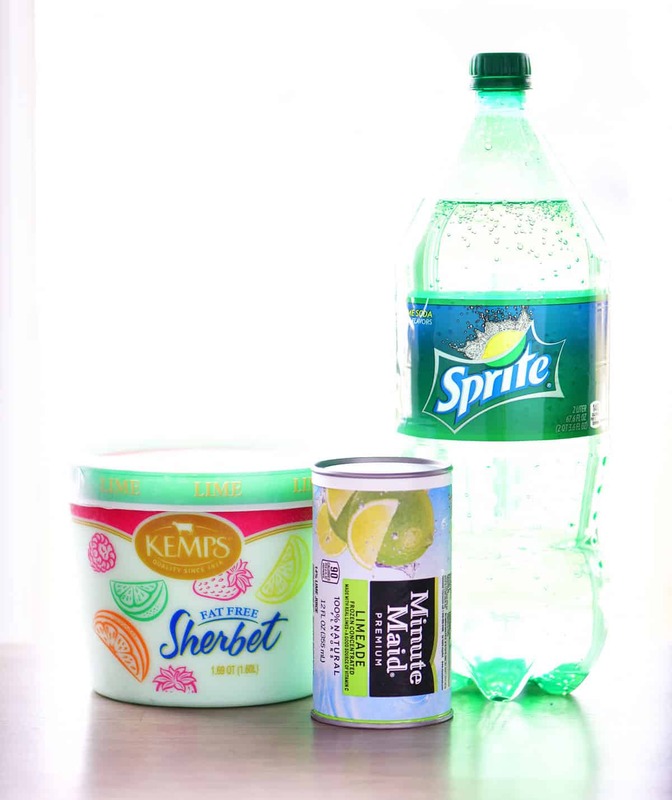 To lighten up your sherbet punch, use Crystal Light for the juice and diet lemon-lime soda. 4. What should I do if the punch is too sour/strong? Add more lemon-lime soda to dilute the punch. 5. What kind of lemon-lime soda should I use? The brand isn’t important in this case. You can use 7-Up, Sprite, Sierra Mist, or the store brand lemon-lime soda. Ginger ale would also work in all of these punch recipes. This Cranberry Orange Holiday Punch recipe is delicious and refreshing. It’s a holiday beverage everyone can enjoy at your Thanksgiving, Easter or Christmas dinner! Sparkling Apple Cider is a refreshing holiday punch with a delicious tangy sweetness and bit of fizz! Apple slices and cinnamon sticks add flavor and make it pretty! Pomegranate Lime Holiday Punch is a pretty family-friendly drink that’s perfect for holiday celebrations & parties from Thanksgiving to Christmas! Put frozen juice concentrate and cold water into a pitcher. Stir until combined. Add four scoops of sherbet and stir until melted. To serve, put one scoop of sherbet in each glass. Fill the glass halfway with sherbet punch mixture. Add lemon-lime soda until the foam reaches the top of the cup. Serve immediately. For optional garnish, add wedges or slices of fruit. 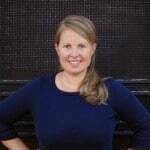 See blog post for answers for FAQs and substitution suggestions. Thank you!! I love having punch at pot lucks and family dinners. I can’t wait to try these recipes.